With over 130 miles of pristine coral reefs the Florida Keys has a monopoly on reef fishing. The only living coral reef in the Northern Hemisphere where abundant marine life mixed with some amazing natural structure makes for an incredible arena for sport fishing enthusiasts and seafood seekers. We offer trips that specialize in reef fishing daily out of the Florida Keys and Key West. 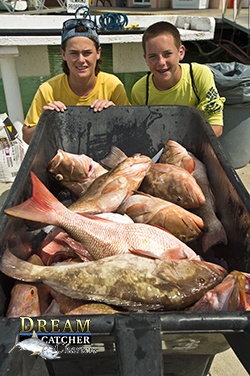 Fish for the species that we all know and love such as snapper, grouper, mackeral, tunas, jacks and barracudas. There is always something to do on the reef year round. Check out our Florida Keys fishing seasons calendar to see when the best time to go fishing for your favorite reef species. Why Book With Us and Our Fishing Guides? The reefs are located 4-8 miles offshore and further if you are fishing out of Key West to the West towards the Marquesas Keys or the Dry Tortugas. Open water conditions will prevale so the boats we use must be able to handle these conditions without beating you up. Speed is another consideration. Travel times are cut with our faster offshore center console outboard powered boats of 27 - 36ft giving our anglers more time to fish on selected 4, 6, and 8 hour trips. 2 persons or less per boat. 4, 6, and 8 hour flats fishing charters are available. 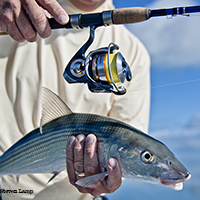 We reccomend that anglers have some experience casting with light tackle spin fishing rods or moderate experience casting saltwater fly fishing rods to get the most out of a flats fishing charter. Those with less experience wanting to fish the flats we reccomend our Florida Keys backcountry fishing charters on board our bay boats. To make a flats fishing reservation the best thing to do is call us directly We are always here standing by to help you put your Florida Keys fishing charter together. Tell us where in the Florida Kesy you are staying and what type of experience you might be looking for. We will offer you some suggestions and put you in touch with a professional fishing guide that we know will take great care of you or we will give you your money back.